Figure 1. 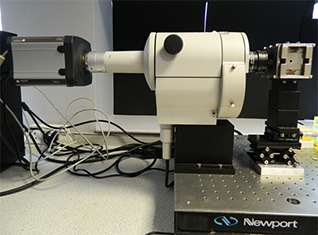 Set-up at Levy’s lab showing the Nikon AZ-100 lying horizontally with the Neo attached on one side and the custom designed NdFeB magnet on the other side. Lara Bogart from Raphael Levy’s research group at the Institute of Integrative Biology in University of Liverpool is interested in understanding how magnetic nanoparticles interact with cells; this is important for a range of biomedical applications including diagnosis of disease, hyperthermia therapy and stem cell tracking applications. The technique they have developed in collaboration with Professor Chalmers in Ohio State University (http://www.chbmeng.ohio-state.edu/people/chalmers.html) uses magnetophoresis to provide quantification of the intracellular content of magnetic nanoparticles. This technique is used to study how different magnetic nanoparticles are taken up by a variety of cells including cancer cells and stem cells. Cells are first stained with DAPI – a fluorophore that binds to DNA and allows the nucleus of the cell to be seen –the cells are then suspended in glycerol solution and inserted into a glass capillary tube. The capillary tube is then placed in a custom designed NdFeB magnet, which creates a magnetic field gradient and the cells are imaged by fluorescence using a Nikon AZ-100 that has been customised to lie horizontally rather than vertically (Figure 1). Cells labelled with magnetic nanoparticles move toward areas of high magnetic field with a velocity that is directly proportional to the number of magnetic nanoparticles within the cells, whilst unlabelled cells will simply sediment due to gravity. By imaging the cells within the area of uniform magnetic field gradient tracks can be generated of the motion of cells (as shown in Figure 2) which can be used to deduce the magnetic velocity. Figure 2. 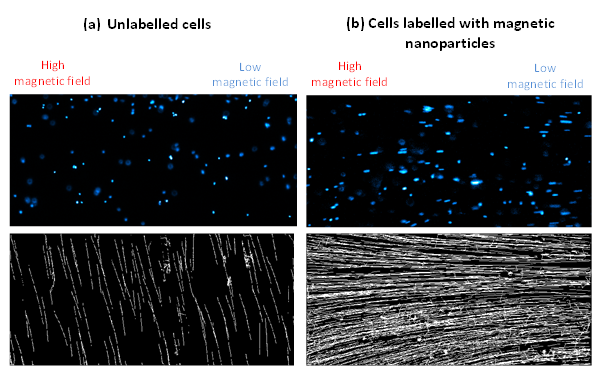 Fluorescence image of cell nuclei (top) and corresponding tracks of motion (bottom) for mouse kidney stem cells (a) no labelling and (b) labelled with magnetic nanoparticles. Dr. Bogart knew when the Neo was purchased that a high specification PC would be required in order to spool large amounts of data fast. It was decided that she would build her own PC as this would work out cheaper than buying a custom built PC from any of the known suppliers. Dr Bogart found that doing this “allowed us to ‘spec up’ on all the individual components such as storage, memory and processing speed. The combination of the fastest available processor with large amount of RAM means that image acquisition is not limited by the computational speed of the PC.” In addition, Dr. Bogart added a solid state drive (SSD) for image spooling between the camera and the PC because SSDs are capable of write information much faster than conventional hard disk drives (HDD). As a result, the kinetic series parameters are not limited by the write speed to the hard disk. However, as SSDs do not offer the same storage capacity as HDDs, Dr. Bogart added two 1 TB HDDs to the PC. The computer is housed in a large case which future proofs it for the addition of further HDDs if required. Finally, the operating system used is 64-bit; which allows all 8 GB RAM to be used which is essential when working with large numbers of high-frame rate kinetic series. 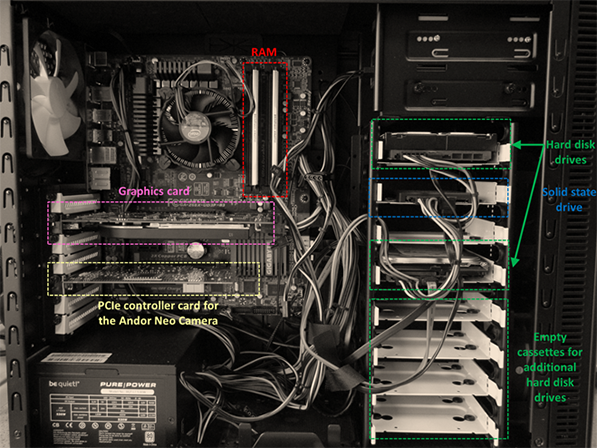 Dr. Bogart built her PC for the Neo sCMOS for £650 (without monitors and DVI cables). Details of the computer specifications can be seen below and in Figure 3. The Neo and Zyla sCMOS cameras are ideal for this technique of ‘magnetophoresis’. Both the Neo and the Zyla have a 5.5-megapixel sensor that offers a large field of view and high resolution without compromising read noise or frame rate. The small pixel size of 6.5 micrometers ensures sufficient oversampling of the pointspread-function, even for objectives with low magnification (e.g. 10x NA 0.3; 20x NA 0.5). The read noise is very low, even when compared with the highest-performance slow readout CCDs. The Neo can achieve a read noise down to 1 e– rms, while the Zyla has a read noise of 1.2e- rms, both without signal amplification, while reading out 5.5 megapixels at 30 & 100 frames per second respectively.